First my hand is under which catagory. Second my hand shape is under which catagory. Water, air, fire or earth. I would say that is fire/water handshape, and (guessing) dolichocheri. But maybe Martijn would disagree with his new chart? Sorry for not responding earlier, I hope you have measured your breadth at the metacarpals just below the fingers? 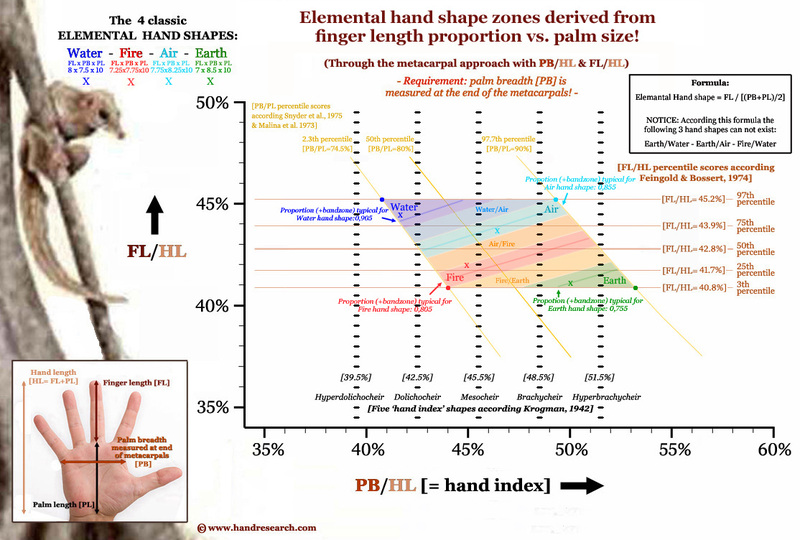 If so, then I can confirm Lynn's assessment for a dolichocheir hand shape in terms of Krogman's vocabulary and based on the elemental hand shape 2,0 approach approach your hand can be described to have finger length to palm size ratio that is typical for air hand shape - see picture below. PS. I realize this may appear inconsistent with Lynn's feedback in terms of a fire/water hand shape - which I can understand in terms of the traditional approach. The elemental hand shape in the new chart isnt accurate at all and clearing show air handshape. I think it is a fire handshape. Sengkanglee wrote: The elemental hand shape in the new chart isnt accurate at all and clearing show air handshape. I think it is a fire handshape. Well, the point may be here that your perception is probably based on the (unbalanced) traditional model, where finger length is assessed relative to just one factor of the palm: palm length or palm width. Unfortunately your comment so far is not substantiated well, but I would welcome you to describe more precisely what you have in mind. PS. I hope you are aware that there are various models in the world available to describe elemental hand shape; for example, the approach taught at the (former) British cheirological society is very different from the American IIHA teachings. Sengkanglee I expect if I was reading your hand face to face I also would have said fire hand - rectangular palm, short fingers in relation to palm length . But going strictly by the measurements, your palm is slightly narrower than standard fire hand, and middle finger is the same as palm width, hence I said fire/water. In my system I don't see your fingers as being long enough, nor your hand square enough, for an air hand in the system I learnt. (British Cheirological Society). That is my right hand picture. Long palm and short finger. Do you know what is the measurement standard fire handshape or standard water handshape. In the system I use, fire hand is proportioned: palm 10x8 cm, middle finger 7.5cm. Water is narrower with longer fingers.